UDM Downloads > Absolute MP3 Splitter! 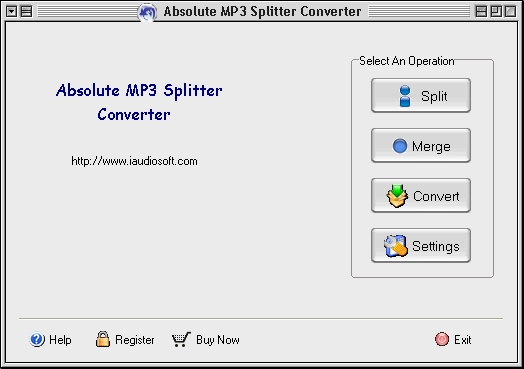 Absolute MP3 Splitter is a powerful audio split,merge and convert software,which can split your large audio file into small pieces and merge audio files in one large file ,convert between audio formats without losing quality, in spite of the source format and target format. It supports four popular audio formats:MP3,WAV,WMA and OGG. The step by step wizard makes the splitting job very easy to understand. Further more,you can edit the ID3 tag information of the target file. It supports bitrate and frequency settings of audio formats.It also supports VBR of MP3 and OGG. Main Features: Split audio file:Split a large audio file into small pieces in spite of the source format and target format.For example,you can split an mp3 file into several small mp3 files and even into wma,wav and ogg files according to your settings; Merge audio files:Merge several audio files in one large file in spite of the source format and target format.For example,you can merge some mp3 files and even wma,wav and ogg files into a large mp3 file according to your settings. Convert audio formats:Convert audio formats between MP3, WAV, WMA, OGG in batch mode. Various Splitting Mode:You can split an audio file by three mode:1,by amounts:split in certain parts with the same length;2,by time:split by every certain time length;3,by user settings:You can set the start-time and end-time of cutting/joining when pre-listening to the song. Step by step Wizard:The step by step wizard makes splitting job very easy to understand. Frequency and Bitrate settings:Absolute MP3 Splitter supports frequency and bitrte settings. To get higher quality of target files, you can set the frequency, channels, and bitrate, before splitting or merging. File Information:You can view splitting file information such as title,artist,album,and so on;You can also edit the Id3 tag information. Support MP3,WMA,WAV,OGG formats.